DD Direct Plus, which is now FreeDish, is India’s only free to air digital direct-broadcast satellite television. Encouraged by the increasing viewership and reach, Doordarshan is now planning to make a major expansion for FreeDish. As per reports coming in, Doordarshan will increase the channels available under FreeDish to 112 by March end. Right now, there are 64 channels available for FreeDish users, which includes Aaj Tak and Big Magic, which are otherwise paid channels under private DTH services. Speculations are rife that some other big names of TV news and entertainment niche may now be included under FreeDish to provide free access for majority of Indians. As per IndianTelevision.com, DD director general C Lalrosanga has recently conducted several meetings to successfully implement this major expansion from the state controlled broadcaster. 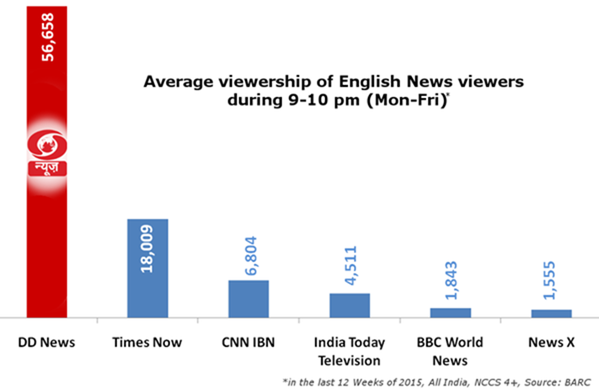 Interestingly, viewership of DD News is thrice that of India’s largest English news channel for prime time spot (Monday-Friday, 9 PM to 10 PM). After this expansion mode, we may expect a surge in Doordarshan’s viewership and impact. As per the reports coming in, Doordarshan is now attempting to make hardware compatible for all their viewers, so that this expansion actually makes sense. After all, if majority of their viewers doesn’t have the required infrastructure to receive free to air channels, then there is no point in expanding so rapidly. In order to achieve this, DD is acquiring Bangalore based ByDesign’s CAS (Conditional Access System), which will help them to provide the required hardware at cheaper costs. DD General Director has already met ByDesign’s engineering team and process is currently underway to make a smooth transition. ByDesign manufacturers CAS enabled set-up boxes, which will allow the FreeDish’s viewers to access all 112 channels by March end. As per Lalrosanga, DD will soon switch to MPEG4 from the current MPEG2; for which CAS enabled set-ups boxes are a necessity. Department of Electronics and Information Technology (DeitY) is providing ByDesign a support of Rs 19.79 crore, which will enable them to manufacture such CAS enabled set-up boxes at a lower price which is affordable by all. As per reports, this new set-up box will cost somewhere between Rs 700 to Rs 1200. Centre for Development of Advanced Computing (C-DAC) will be helping ByDesign in technological aspect. Besides enabling all 112 free channels on FreeDish, this new set-up box will also enable DD to measure how many households are currently accessing their broadcast; which will in-turn assist in better advertising campaigns. In a unique twist, this new CAS enabled set-up boxes will be encrypted, but still free to air service. DD FreeDish (previously DD Direct Plus) was launched in December 2004 and right now, INSAT-4B satellite at 93.5° is used to broadcast 64 FTA MPEG-2 Channels, 48 MPEG-4 channels and 29 radio channels using this platform. Here is a complete list of channels which are currently available for FreeDish users (updated as of January 18, 2016). "Free DTH Channels on Doordarshan's FreeDish Will Be Increased To 112 Channels by March, 2016", 5 out of 5 based on 4 ratings. sir share market channel lunch kero. sir, DD DIRECT CHALOO HUI BHUT TIME HUA PER IPL-TELECAST BHAI TAK NAHI AHA PAYA SIR,IS BAR IPL-2017 LIVE TELECAST DD DIRECT PER KERY.THANKES. sir, please give many of bengali channels of free dth service..